Perhaps it's the cute little shoes on top, or the pretty floral scrapbook paper on each diaper cake layer. Or perhaps it's "Elle" in darling cut out letters on the front. Most likely it's the colorful combination of everything that makes Jennifer Reed's diaper cake so cute! 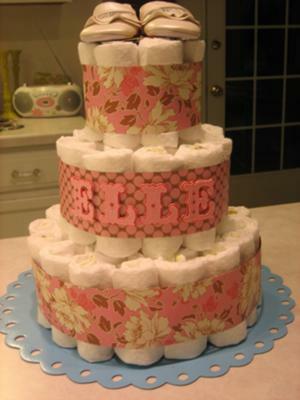 Thanks for sharing your diaper cake with us, Jennifer! This was my first attempt at making a diaper cake and I couldn't believe how easy it was! After looking at your gallery for inspiration and reading how others made their cakes, I decided to use the rolling/hairband/rubber band method. I popped in a movie, and rolled away. The scrapbook paper I used was some I already had. I love Amy Butler's patterns. I found the letters and baby shoes at Target.